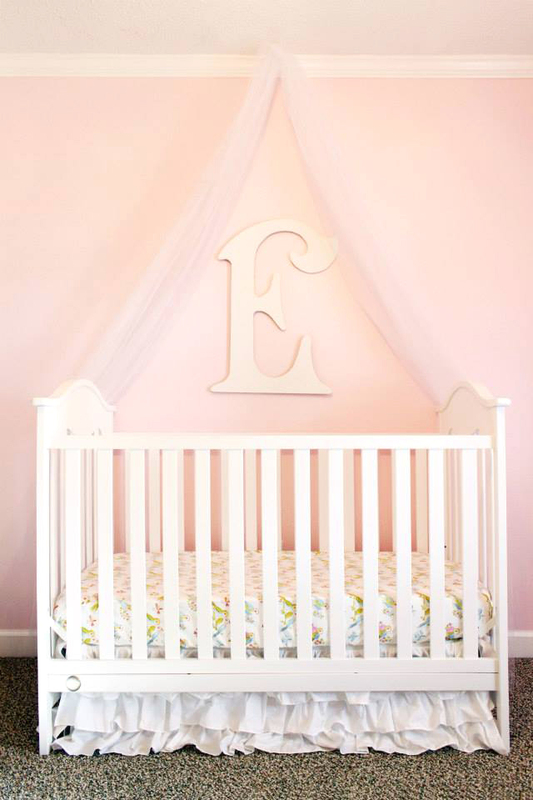 When we started planning Evelynn's room (our first born), we both wanted it to be both a peaceful and beautiful place. We chose the traditional color of pink with white & green accents. It was so much fun planning all the details, and watching it come together. Both of our moms helped with painting, re-doing furniture, and helping us pick out several pieces. Josh put together the crib, and hung the chandelier. The lighting was the most important aspect to him! We spent a lot of time in flea markets trying to find the perfect dresser. We stumbled on an antique dreser that needed a lot of TLC. My mom painted it with white chalk paint, and we replaced the middle handle with a beautiful parisian knob we found at Hobby Lobby. The nursery theme was baby birds, so I was excited to find fabric via Coursel! His mom found those tiny baby birds for me to use, and they were the perfect addition. The lamp was my favorite find from Target! I stumbled on it one day, and it was $30. I decided to wait and see if I could find something simliar for a better price. A few days later I was at Target again when I saw that it was on sale, so I snagged it up for $20! Talk about an elated feeling. I also found the mirror at a flea market for a steal. It was an oak color, so Josh painted it using the same chalk paint that my mom used on the dresser. It turned out perfectly. Everything came together perfectly, and it's still our favorite room in the house. Yet, in just a few short months we will slowly be changing out a few things for Evie's new "big girl" room. So, I needed to document all it's sweet little beauty for my future mama heart. I love the story behind the teddy! What a great idea! 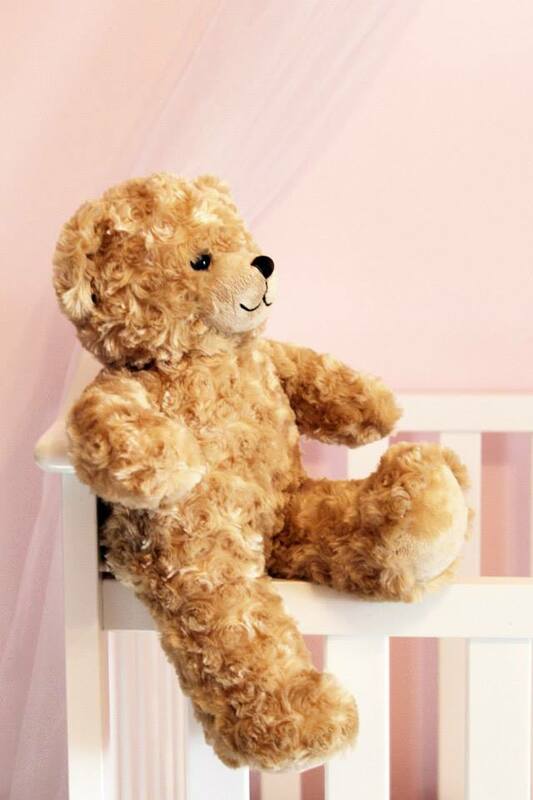 It's difficult to find a classic old-fashioned looking teddy bear but I'm determined that each of my children have one! 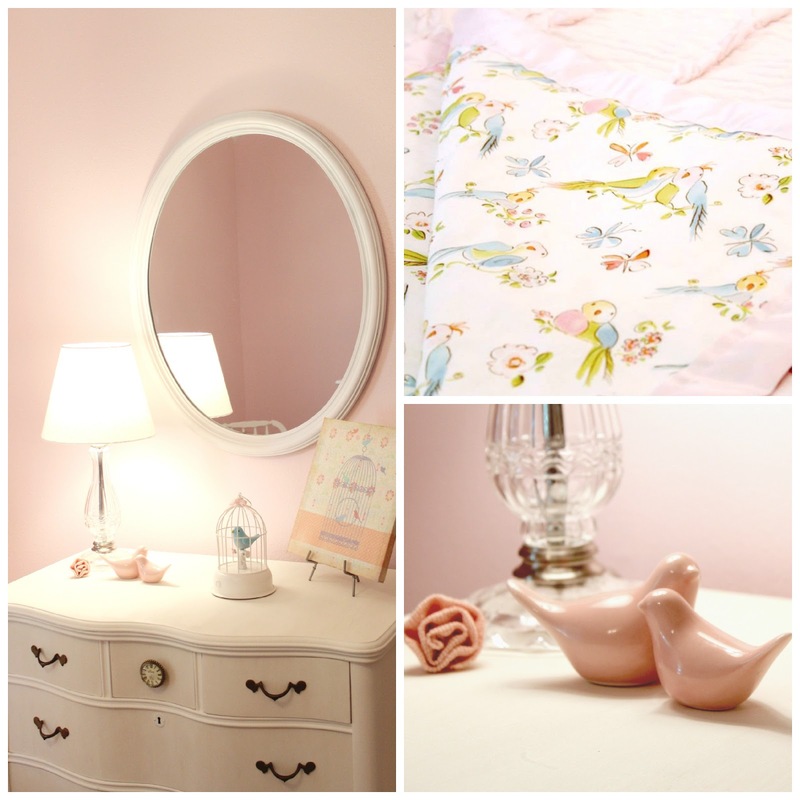 That bird fabric from carousel is beautiful isn't it!? I recently purchased the accent damask fabric from that collection and the colors are just gorgeous. Gorgeous room! I love those pink birds. What an adorable nursery!! I bet Evie is excited for her big girl room next! Can't wait to see and fun to follow all of your baby progress too.